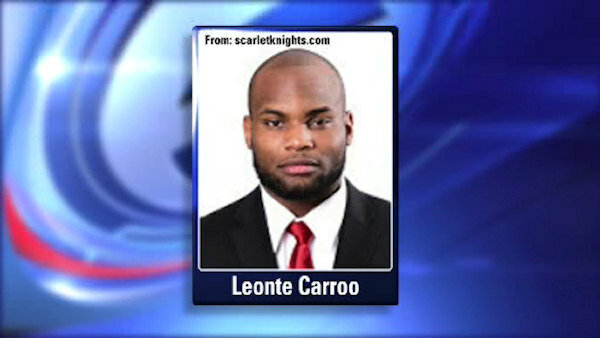 NEW BRUNSWICK, N.J. -- A judge has dismissed simple assault charges against Rutgers wide receiver Leonte Carroo. The charges were filed last month after authorities said Carroo attacked a woman after a football game and slammed her onto concrete. The woman received injuries on her hip, hands, elbow and head. A Piscataway municipal court judge dismissed the charges Tuesday night after the woman said she didn't want to testify. Earlier Tuesday, another judge had lifted a temporary restraining order filed against Carroo. That came after the woman he was accused of attacking said she didn't think it was necessary. The team suspended Carroo when the charges were filed. But his lawyer said he plans to petition the school to lift the suspension. Interim Rutgers coach Norries Wilson declined to comment Tuesday on Carroo's status.